New paleo calibration series done – enables more accurate calibration of radiocarbon datings | Watts Up With That? Drill at Lake Suigetsu, located in Mikata near the Sea of Japan, is one of the rare cases in which annual layers have been preserved in the sediment. By using a new series of measurements of radiocarbon dates on seasonally laminated sediments from Lake Suigetsu in Japan, a more precise calibration of radiocarbon dating will be possible. In combination with an accurate count of the seasonal layered deposits in the lake, the study resulted in an unprecedented precision of the known 14C method with which it is now possible to date older objects of climate research and archeology more precisely than previously achievable. This is the result published by an international team of geoscientists led by Prof. Christopher Bronk Ramsey (University of Oxford) in the latest edition of the journal Science. The radiocarbon method for dating organic and calcareous materials uses the known decay rates of the radioactive isotope 14C, which is formed in very small amounts in the upper atmosphere by cosmic rays. Since the formation of 14C is affected by Earth’s magnetic field and solar activity and is therefore not constant, this relative time scale is has no absolute timestamp in calendar years. The timescale developed through the measured decay rates must thus be calibrated to indicate the age in calendar years. This works best with a parallel count of annual layers in lake sediments or tree rings. A calibration reaching very far into the past was now possible with data from the Suigetsu Lake, located in Mikata near the Sea of Japan. Here, a drill core could be retrieved from the sediments whose seasonal resolution dates back to over 50,000 years ago. The Suigetsu Lake is ideal for using both dating methods, measurement of 14C and counting of annual layers, because deciduous trees grew on its shores during the last ice age, the leaves of which were preserved in large numbers in the sediments and are ideal for 14C dating. At the same time, this lake is one of the rare cases in which annual layers have been preserved in the sediment. Due to the long experience of Achim Brauer’s working group with creating precise calendar time scales from lake sediments, the GFZ scientists were entrusted with this task. Using special microscope techniques, it was possible to decipher the detailed structure of the finest, thousands of years old layers in the Suigetsu sediments. The scientists identified springtime layers which were formed by the melting of snow, summer layers of organic material or algae residues, fall layers of a special iron carbonate and winter layers of fine clay. The knowledge of this seasonal rhythm of sedimentation was the basis for the exact annual layer timescale. The high quality of the new Suigetsu chronology for the period from 12500 to 52800 years before present is shown by the fact that it was selected as the basis for the next iteration of the IntCal compilation, an internationally valid composite record of radiocarbon calibration. ← Friday Funny – why wouldn't he dress up as Yamal YAD06? We normally put the number after the element to avoid confusion with the temperature. Hence O², C14, C12. 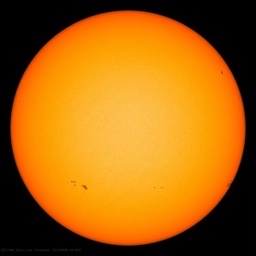 So we should get a sharper resolution on the timing of solar changes from this, since Earth’s geomagnetism is approximately inversely correlated to it. – Excellent stuff. It sounds like it is more accurate and precise. 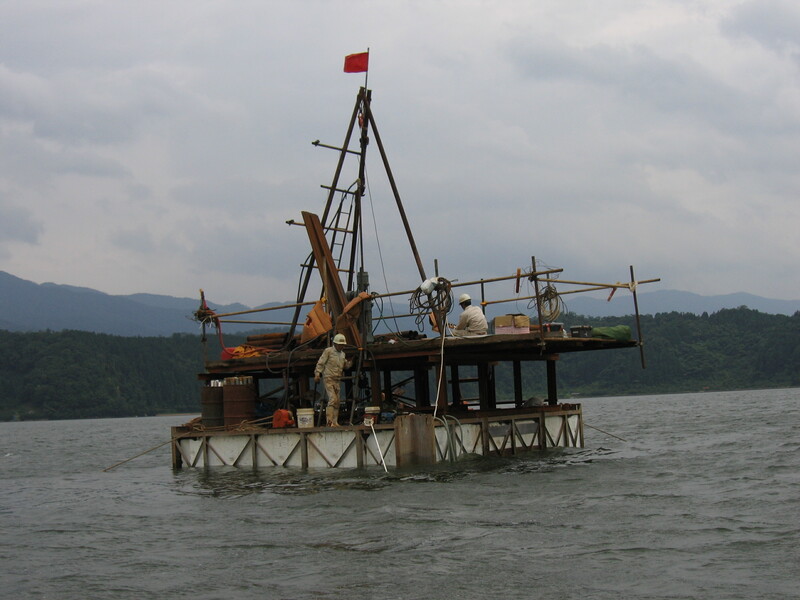 Due to the long experience of Achim Brauer’s working group with creating precise calendar time scales from lake sediments, the GFZ scientists were entrusted with this task. What, the Climate Rapid Response Team wasn’t selected! Oh, the travesty! This is very valuable research because accurate dating of paleoclimate proxy material has been a constant problem. This research seems to provide a better method for determining both absolute and relative dating. Of course, it also helps in many other disciplines like archaeology. However, in climatology, like all rhythmites or layers, it is in danger of being applied to the wrong major cause. Tree rings began as dendrochronology, that is establishing a time sequence, but were adapted to dendroclimatology and then misused to represent temperature. They, like the layers in the lake, are primarily a function of precipitation. The same situation applies to stalactites, another build up of layers adapted to temperature but primarily a function of precipitation. Outstanding! It would be great to find another lake or another body of water elsewhere in the world to compare results. I imagined preparing 50,000 samples for 14C analysis. Another abstract (3) indicates there were 182 to cover 50,000 years. I wish I still had free access to paywalled papers. 1) A Complete Terrestrial Radiocarbon Record for 11.2 to 52.8 kyr B.P. We can not have to many calibration sites for C14 or other decay based timing methods. The more and the more well defined, the better. Nothing in nature is ever absolute. Absolutes are usually in the theology or ideology of the beholder. The great danger in all this is we may begin to believe we know that which we do not. No reason of course not to support and study the subject, however. The same situation applies to stalactites, another build up of layers adapted to temperature but primarily a function of precipitation. and it shows unexpectedly good correlation, exception being the 1820-1840 period, the aftermath of Dalton min or more likely the major volcanic eruptions of Mayon and Tambora. As result of this I would suggest that the stalagmite deposits (since once formed they do not alter) of the N.W Europe could be another good proxy for assessing not only precipitation but retrieving extent of the solar activity. I’m waiting for some temperature proxies from that lake. You think it might show some some hot spells? Maybe a good MWP ouside of Europe? All well and good. But, I’d feel a lot more comfortable about the use of the word ‘precise’ if this record is validated by a more precise sedimentary record from a boring geological site. Japan is too prone to severe seismic events to be absolutely comfortable with layers being annual deposits. Bioturbation causes a smearing or averaging of deposition down to the depth of biological activity. Depth of biological activity (cm) divided by deposition rate (cm / year) roughly gives the number of years averaged into each annual sediment layer. Once again the reporting of an important study is perverted to a propaganda piece to keep the narrative alive in the minds of the brainwashed masses. Never mind that accurate calibration of radio-carbon dating is critical in answering some of the most compelling question dealing with human prehistory, especial concerning the Aurignacian culture. And most importantly for me, accurate dating of the first signs of the domestication of dogs. Found a good number of pictures on the web, and the layers are extremely well defined. I referred to stalactites because stalagmites are formed under stalactites from the liquid dripping down. ( my memory trick for students was the (c) means ceiling, the (g) means ground). I am not surprised you found a correlation with solar activity and earth’s magnetism variability. In fact, Douglass’ original studies of tree ring data showed the relationship between precipitation and sunspot data. The IPCC focus on CO2 and temperature (warm only) has been a great distraction in advancing climate research and understanding. I wonder if you guys would change your minds about the quality of this study if they could also extract temperature data and they came up with a hockey stick. Would it actually convince any of you or would it be the same old routine ? This might be a silly question, but if the decay is expressed by a mathematical curve, how can it vary? If the samples do vary from the expected decay curve, what would explain it and could whatever that is have other effects? The decay rate does not change, but the starting condition does. The starting condition is dependent on the production rate of C14 when the organism was alive. This production rate varies dependent on a number of factors, one being the rate of cosmic ray bombardment of the earth. In geological terms these are huge changes in a short period of time of a decade or two. Combined with the reduced solar activity consequences for the N. Hemisphere’s climate change may be important. According to some of my calculations there is 15-20 year delay before any climatic response may take place. Good job the didn’t let Mann do the study, he would probably have inverted that sediment data and ended up showing the last glaciation happened after Younger_Dryas. I’m a little surprised that the researchers took the C-14 dating out to 50,000 years as at this point there is likely to be no C-14 left. With a 5730 yr half-life, there are dang few molecules of C-14 in anything that sequestered it more than 30,000 years ago which makes for difficult measurement (long,long count times) and high error bars. Until the radiation measurement techniques in the paper are well vetted, be a little cautious in taking the paper to heart. C-14 measurement techniques are well known, so I would suspect this paper is okay, but it is generally acknowledged that any measurements past 20-30 kyrs are probably a little dicey. Cannot do it now but I will try to look at the paper and see what their measurement techniques were. As long as they remember that some of those ”seasonal” layers will be unseasonal volcanic ash from Japan’s many volcanoes which erupt at unpredictable times. I’ve always been rather dubious of Carbon dating claims on geological artefacts and the claimed accuracy. It will be interesting to see the actual calibration curve that comes out of this data and how it compares to the two main calibration systems currently used. There is a plateau in the middle of the calibration curve that is quite sensitive to error, so seeing how this period shapes up will be important. 182 samples over 50k-13 BP gives an average internal of about 200 years. It’s a shame they did not sample more closely, it would have been interesting as a climate record to see sampling at least at 50 year intervals. But I suppose they had determined that 200y sampling was sufficient for their objective of C14 calibration. I think that’s a bit OT, rgb, but also I think the Creationists response is that The Creator also created the sediment layers. 50k is just over 8 half lives, that means there will be about 0.25% of the original C14 left. Small but not immeasurable if you have a reasonable amount of the sample. The core quality is reportedly good, so with careful sample preparation and analysis there’s not reason why this should not extend the useful range of C14 calibration. Like I said above, the difficult part is the middle of the calibration range where slope is a lot flatter, thus very sensitive to any measurement errors. This is where I would expect to see the most significant reduction in calibration uncertainties. I would love to see improvement in the reduction of uncertainty in that middle range. That’s when human culture really started to take off, highly specialized tool kits, textiles, pottery, art. Before becoming too enthusiastic about improved accuracy of 14C dating, remember that this affects only the conversion of 14C years to calendar years. The presently existing 14C caliabration curves (14 yrs vs. calendar years from tree rings) is not a straight line, but rather a wiggly curve with multiple intercepts (as a result of varying neutron flux over time). Thus, a single 14C date can have as many possible calendar year equivalents as there are intercepts, i.e. a 14C date may have two or three (or more) possible calendar year equivalents. The new calibration should show the same relationship, becoming less accurate the older the age of the sample. The new calibration will not change the number of intercepts of 14C years and calendar years on a calibration curve and thus will not solve the problem of multiple possible calendar age equivalents for any 14C date. However, it should improve the calibration curves beyond about 15,000 years where tree rings are lacking for conversion of 14C years into calendar years. The new calibration curve will not affect the accuracy of sample dating, which depends on the precision of gas counting or accelerator measurements before putting them on a calibration curve. So don’t expect radiocarbon ages themselves to be more accurate, only the conversion of the 14C ages into calendar year ages. P. Solar: I wholly concur with your assessment, I was just keeping it simple for those who have no knowledge of radiation measurement. As you are obviously aware, there are a host of complexities when doing carbon dating: sample collection, sample preparation, counting instrument limitations and errors, just to name a few. I would hope these researchers did a good job in accounting for all the issues, but I always take studies using radioactive sources with a grain of salt until I see them properly vetted. I’ve seen way too many poorly done studies. P. Solar’s statement that 0.25% can be measured is correct, but as he notes it depends on the original quantity (# of atoms). With the decay (a single beta particle emission) of a C-14 atom, it instantaneously becomes a N-14 atom which is not radioactive. With time, there are fewer and fewer C-14 atoms in the sample – 50% of the C-14 atoms are gone with each half-life period (~5,500 years). If you start with 1E26 atoms, you will still have enough atoms to count (with good statistics) at 0.25% or roughly 8 half-lives. However, if you start with 1 million C-14 atoms, at 8 half-lives you will not have enough atoms emitting radiation in a reasonable counting time because you might only see one decay roughly every two years (this is based on statistics and it must be remembered that all of the C-14 atoms could have changed to N-14 by this time or there may be a greater quantity than calculated by the half-life). Would their spectral analysis method also capture concurrent BE10 depositions without re-sampling? I would love it if they extracted temperature data, they undoubtedly would come up with several hockey sticks over the past 50,000 years. The question is, would it actually convince YOU or would it be the same old routine?